I just finished watching this film "Courageous" and I would like to recommend it for every man - for the husbands and fathers; and for the men not yet married. 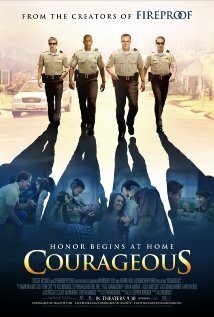 "Courageous" is about four police officers who struggle with their faith and their roles as husbands and fathers when tragedy strikes close to home. Together they make a decision that will change all of their lives. I would like to share this quote from Adam Mitchell (acted by Alex Kendrick). It summarises the essence of a father in a home. ...I now believe that God desires for EVERY father to courageously step up and do whatever it takes to be involved in the lives of his children. But more than just being there providing for them, he is to walk with them through their young lives and be a visual representation of the character of God, their father in heaven. A father should love his children, and seek to win their hearts. He should protect them, discipline them, and teach them about God. He should model how to walk with integrity and treat others with respect, and should call out his children to become responsible men and women, who live their lives for what matters in eternity. Some men will hear this, and mock it. Or ignore it. But I tell you that as a father, you are accountable to God for the position of influence he has given you. You can't fall asleep at the wheel, only to wake up one day and realize that your job or your hobbies have no eternal value, but the souls of your children do. Some men will hear this and agree with it, but have no resolve to live it out. Instead, they will live for themselves, and waste the opportunity to leave a godly legacy for the next generation. But there are some men, who regardless of the mistakes we've made in the past, regardless of what our fathers did NOT do for us, will give the strength of our arms and the rest of our days to loving God with all that we are and to teach our children to do the same. And whenever possible to love and mentor others who have no father in their lives, but who desperately need help and direction. And we are inviting any man whose heart is willing and courageous, to join us in this resolution. In my home, the decision has already been made. You don't have to ask who will guide my family, because by God's grace, I will. You don't have to ask who will teach my son to follow Christ, because I will. Who will accept the responsibility of providing and protecting my family? I will. Who will ask God to break the chain of destructive patterns in my family's history? I will. Who will pray for, and bless my children to boldly pursue whatever God calls them to do? I am their father. I will. I accept this responsibility and it is my privilege to embrace it. I want the favor of God and his blessing on my home. Any good man does. So where are you men of courage? Where are you, fathers who fear the Lord? It's time to rise up and answer the call that God has given to you and to say I will. I will. I will!